We love this time of year, when all the seasonal foods come out. In case you hadn’t noticed, fall in Michigan means certain harvests are happening that don’t occur the rest of the year. Pumpkins are out in force right now, with pumpkin farms such as Houpt’s Pumpkin Patch and Corn Maze on M-50 west of US-23 having some beautiful pumpkins on their land as of just last night when we drove by. Nothing says fall like a pumpkin ale and a bonfire! This past Friday on my way to get my kids so Mary and I could take them to Walpole Island, Ontario for the weekend, I stopped in to the Market to get some of the pumpkin beer Erica had mentioned. John and I talked about the various beers Erica had mentioned in the newsletter … Harvest Moon, Buffalo Bill’s Pumpkin Ale, and Ichabod from New Holland Brewing. He told me the Harvest Moon had the most pumpkin flavor, but because of that, Erica tended to favor the Ichabod, which had a lighter pumpkin flavor and more of a German ale feel to it. As the Ichabod Pumpkin Ale was also the only one of the three that’s made in Michigan, that’s the one I purchased. Mary and I found the Ichabod Pumpkin Ale has a decidedly German ale taste and texture immediately. The pumpkin flavor becomes apparent more in the aftertaste than in the flavor of the beer itself, with the cinnamon and nutmeg adding a tiny bit of a nice spiciness. I then found that I could really taste the pumpkin if I took a larger swig and held it in the mouth for a few moments. Neither Mary nor I have ever become drunk on beer … we love the flavor of certain ones, and if either of us drinks two beers within a day, that’s a lot! 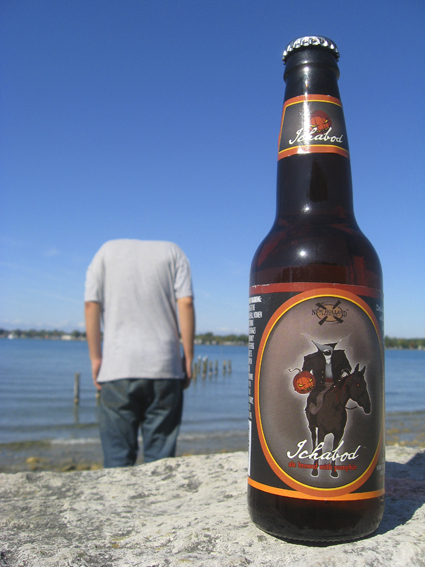 The New Holland Brewing Ichabod Pumpkin Ale is something we’ll definitely buy again. Special thanks to 14-year-old Adam for posing as the Headless Teenager on a huge rock on the shore of the St. Clair River on Walpole Island, Ontario … insisting on re-doing the pose himself six times until it looked right on the preview … and thanks to 10-year-old Ryan for fussing with Adam’s shirt to get the weird wrinkles out each time. (Ryan was actually hiding behind the rock the beer bottle was sitting on in this image.) No Photoshopping required! Thanks, guys!! !